Nepal and Canada established diplomatic relations in 1965, and have enjoyed longstanding friendly ties ever since. Canada has always supported Nepal’s socio-economic development. But recently, bilateral interactions between the two countries have entered a new phase, following the first bilateral meeting between our prime ministers and the subsequent signing of a memorandum of understanding establishing a bilateral consultation mechanism in September 2018. Bilateral trade between Nepal and Canada is modest and therefore ripe for growth. Nepal’s main exports to Canada include carpets, garments, pashmina, headgear, handicrafts, tea, coffee and herbal oil. Nepal’s main imports from Canada include vegetables, aircraft and parts, nuclear reactors, paper, oil seeds, oleaginous fruits (those used to make oil) and electrical equipment, among others. Nepal is eligible for Canada’s least-developed-country-tariff treatment, which extends duty-free, quota-free access to almost all products imported from Nepal. Even so, it seems sustained demand and easy market access, including trade support incentives, are essential for increasing trade volume. In addition, exchanging trade delegations, participating in trade fairs and exhibitions, and making regular contact with potential buyers are also necessary for boosting bilateral trade. Both our countries must exchange trade delegations and facilitate and support participation in trade fairs. 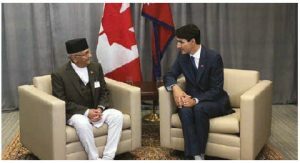 Nepal will be happy to explore trade-supporting measures in light of Canada’s enhanced focus on trade. Trade Facilitation Office (TFO) Canada and the Trade and Export Promotion Centre (TEPC) of Nepal could collaborate to seek opportunities for enhancing bilateral trade. With the formation of a stable government in the country following the federal elections held in 2017, the Nepalese government is squarely focusing on an agenda of development and prosperity to realize the vision of “Prosperous Nepal: Happy Nepali.” In order to realize this overarching goal, the country must focus on trade and investment. Nepal welcomes foreign investment in almost all sectors. Priority areas include energy, agriculture, transport, infrastructure, tourism, industry and information and communication technology. There have been increased investments in the limestone and cement industries in recent years. Nepal’s bilateral trade treaty with India allows products manufactured in Nepal to enjoy duty-free market access in India. Similarly, a large number of products made in Nepal also enjoy duty exemptions in Chinese markets. This provides immense incentives for foreign investors to establish plants in Nepal and leverage the vast markets available in neighbouring India and China. Furthermore, the availability of cheap, English-speaking labour and reduced tax rates offer extra incentives to potential investors. Nepal has tremendous hydropower potential, which is estimated to be more than 43,000 MW. In the hydro-energy sector, Nepal has signed power trade agreements to export its energy to neighbouring countries. Similarly, cross-border transmission lines are under construction to foster energy-grid connections and energy trade. Harnessing hydroelectric potential will not only provide Nepal with a more reliable source of electricity, but it could also meet energy deficiency in the South Asia region. Canada’s own Manitoba Hydro Consulting Company is currently engaged as a consultant for ADB in the 140 MW Tanahu Hydro Electric Project in Nepal. Nepal is fully aware of the fact that foreign direct investment does not come in the absence of an enabling environment. It is in view of this that the country has adopted a very liberal legal foreign direct investment regime. Nepal’s 2015 FDI policy identified the priority areas for foreign investment in many areas, including hydropower (generation and transmission). The policy is much more investor-friendly, with many provisions revised and updated to attract and facilitate foreign investment. In addition to this, foreign investors are also allowed 100-per-cent ownership of a company in most sectors. Repatriation of capital and profit is permitted without any restrictions. Nepal’s tax regime is very transparent, predictable and investor friendly. Canadian investors are cordially invited to explore the opportunities available in Nepal for mutually beneficial ventures and projects. Kali Prasad Pokhrel is ambassador of Nepal to Canada. Reach him at nepalembassy@rogers.com or (613) 680-5513.